At the end of the 1920's, when the United States was ailing from the Great Depression, the numerous air shows were a rare pastime for many people who were disillusioned with their future and wanted distraction from the gray life around them. Pilots and stuntmen who every weekend entertained an ordinary audience, also dreamed of another existence, one with much less risk of losing their livelihood at any moment, and often even their life. Many former barnstormers soon went on to find work in newly formed airlines and numerous mail and cargo delivery services, but some of them, such as Clyde Cessna and Walter Beech, devoted their lives to aircraft building. In 1924 they founded a small company, Travel Air Manufacturing, which soon was absorbed by the aviation giant Curtiss Wright. Some years later Walter Beech together with his wife Olive founded their own aircraft manufacturing company, the Beech Aircraft Corporation. One of the first successful projects of the newly formed company was the Model 17, which acquired the name Staggerwing because of its unconventional biplane wing arrangement - that is, with the upper wing located to the rear of the lower one. The new aircraft was designed by the company as a luxury high-speed cabin plane for short-distance flights, but America was just coming out of the Great Depression, so orders for this novel type from Walter Beech were scarce in the early years. In the mid 1930's the designer made a number of changes to its construction - the fuselage was lengthened, the ailerons were moved to the upper wing, and the track of the undercarriage extended. 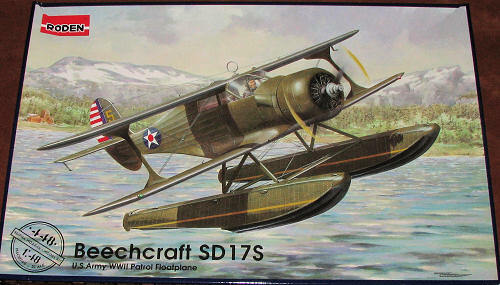 The modified version was designated the D17 and quickly won the favor of pilots. Before the Second World War the company was able to sell 424 planes of this type and not only in the U.S. The D17 gained great fame after taking part in the prestigious Bendix Trophy race, and in 1937 pilot Jackie Cochran set a women's speed record of 203 miles per hour. The Staggerwing experienced war before the U.S. joined WWII: it had time to fight in the sky of Spain, and in the confrontation between China and Japan. After the turning point of Pearl Harbor the U.S. military authorities began to be more interested in types which pre-war might have been considered as of little use for military purposes. The Beech D17 was ideal for the role of liaison aircraft - it was small, compact, and with good speed and an excellent cabin it ideally met the requirements of a staff transport and aircraft of rapid communication between military facilities. With only minor improvements in order to comply with military specifications, it soon arrived in the Army Air Forces as the UC-43 and in Naval aviation as the GB-1 and GB-2. The government ordered 270 such aircraft from Walter Beech's company, and at least another 118 were purchased by the government from private owners for military needs. They always had work at all major air bases and in the vast spaces of the U.S., from Texas in the west to the District of Columbia in the east. The Naval planes were often used far from the sea, and were immediately noticeable at airfields among their army colleagues because of their incongruous blue camouflage. Before the U.S. entered WWII several Staggerwings were sent to the UK, however not for the Air Forces of His Majesty, but in accordance with an order from Prince Bernhard of the Netherlands, who at that time was in exile in London. The purchasing committee of the R.A.F., which already worked in close cooperation with the U.S. Lend-Lease program, obviously could not but pay attention to this unique airplane, and soon the Royal Air Force and the Royal Navy received the Staggerwing, on which the British by tradition bestowed their own name Traveller Mk.I, unusually for an American eye spelled with a double "L". By agreement, 107 machines of this type should have been delivered to the British, but at least 12 of them never reached the shores of Foggy Albion, when their U.S. carrier was attacked by a German submarine and sank. Another 95 machines were extensively used by military staff in every territory, from the Orkney Islands in the north to the sandy airfields of the Middle East. After the war they had to be transferred back to the U.S. under the terms of the Lend-Lease agreement, but some Travellers nevertheless found new private owners in the U.K. Post-war the company of Walter Beech returned to the production of an improved civil model, the G17S; however, only 16 aircraft would be built. All of them immediately found owners despite the price doubling compared with that before the inflation of the war period. The last Staggerwing left the factory in early 1949, becoming the 785th series machine after 17 years of production. Remarkable accolades have been won by this aircraft: in 2003, according to a poll in Plane & Pilot Magazine, it was judged to be in the top ten Top Ten All-Time Favorite aircraft of the Twentieth Century. Four years later, according to a poll of three thousand members of the American Aircraft Owners and Pilots Association, the Staggerwing was voted the Most Beautiful Airplane of all time. 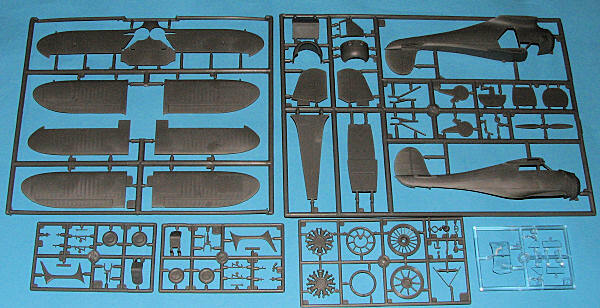 This is, I believe, the third boxing of Roden's rather nice quarter scale Staggerwing. Previously, it had been released with military markings options. This is the first boxing that provides the civil markings for which many have been waiting. Not surprisingly, you get pretty much the same plastic as in the previous kits. The wings both have the ailerons/flaps molded into one wing half to give a nice, sharp trailing edge, something I appreciate. There are also 'cups' into which the flying wires can be inserted, making wha t little rigging there is, an easy chore even for those of us who are intimidated by rigging. Clear parts are a bit cloudy when compared to some, but a dip in clear gloss acrylic should help. What you do get extra are two sprues to do the float version. These are show in the drawings to the left. You still get the wheels and gear and doors for the land plane, so if you have a change of heart, the landplane version can be built, though you will need to cut wheel openings in the bottom of the wing as this one comes with a solid lower wing. A very nice touch is that the upper float pieces are molded as a single, joined piece so this will help with alignment. The kit also comes with beaching gear, which is attached directly to each float, sort of like is done with the Kingfisher. Instructions are quite well done with lots of well drawn detail to help in construction. Paint references are Model Master. There are three options. First is the box art plan e in OD/Neutral Grey from the 28th Composite Group in Alaska during 1941. Next is a 'yellow wings' version with the 1st Air Base Group at Langley Field in 1938. The last is listed as with the USAAF/RAAF Mixed Fighter Group at Brisbane in 1942. Not sure about this final one as you would think it would not have Canadian civil markings and be painted bright yellow. The decals are very nicely printed, but may cause some issues in application so be sure you use very warm to hot water and put them on a glossy surface. That seems to work the best. I'm sure that many are quite pleased that this one has been released and I'm equally sure that you may well see additional boxings, perhaps some 30's schemes this time. Thanks to the minimal rigging, this one should cause little in the way of 'rigging phobia'.